Besides having the advantage of being very local to me, a Tinakilly House wedding video is always a joy to film. The grounds are beautiful and so this really helps to create a scenic wedding video. Sinead and Sinead tied the knot here recently. We had sparklers (always fun! ), a gorgeous flora arch that Sinead’s dad made. Shane’s sister even made the wedding cake. Newlyweds Sinead and Shane were in the good hands of Hannah from Tinakilly House and she made sure everything ran smoothly. It was my first time meeting the wedding celebrant Brian Hade who’s calming influence really helped put everyone at ease. The stunning bride was in the capable hands of makeup artist Orlaith Shore and hair stylist Martina King. 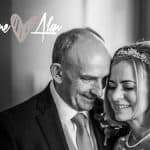 Wedding photography was provided by Daniel from DK Photos, always a joy to work with. Evening entertainment was provided by the wedding band Jaker. Here’s a short teaser showing some highlights from their Tinakilly House wedding video. 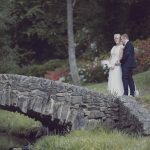 Hand-crafted, award-winning, luxury high-end wedding films in Ireland.